Alfred Bradford, son of Henry and Elizabeth, was christened on 3 April 1820 at the Independent New Chapel at Maidenhead, Berkshire, England. In 1867, he married Lucy Barrett in Sydney and had two sons and two daughters. He died on 7 November 1874, aged 59. He is buried at the Old Church of England Cemetery at Rookwood, Sydney, with his second son Alfred who died on 9 December 1873, aged 33 years. From 1859 to 1873, Alfred Bradford held the license to the Blind Beggar Hotel at 6 South Head Road. His son Alfred Junior acquired the Family Hotel at 2-4 Old South Head Road in 1867. 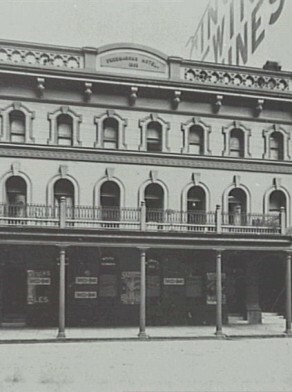 In 1873, Alfred Bradford Senior held the license for the Freemasons Hotel at 198 York Street. Also in 1873, Alfred Bradford Junior became the licensee of the Sir Joseph Banks at Botany. Alfred Bradford Snr was Alderman for Brisbane Ward, 1 December 1866 to 30 November 1870.